Below is a guest post by Zach Scheidt who not only has been a long time reader, but actually helped me with some "blogging" tips when I first launched 2 years ago. This is a follow up piece on the Colocation Industry, of which we touched on Equinix (EQNX) last week. [Jul 23, 2009: Equinix - Hostess with the Mostess] I have had an oustanding limit purchase order (lower obviously) on this name since my piece, but the stock has not faltered one iota the past 4 days. Still waiting (crouching tiger...). 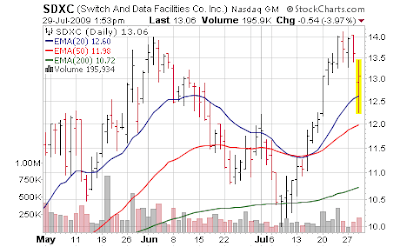 Savvis just reported this morning, and likewise - the market likes the smaller than expected loss. The space is doing well on a relative basis and we are desperate for the few niches of secular growth available in the world, here at FMMF. IT services company Savvis Inc (SVVS) posted a narrower quarterly loss, helped by a 9 percent increase in hosting segment revenue, sending its share up as much as 12 percent. Revenue from hosting services -- which manages IT infrastructure for clients -- was $152.2 million for the second quarter compared with $139.5 million a year ago. Zach runs the blog ZachStocks.com which focuses on uncovering investment opportunities in growth stocks – trading from both the long and the short side. Zach also is the Principal and Chief Investment Strategist at Sound Counsel Investment Advisors – a boutique investment company which seeks to provide independent investment advice to individuals while minimizing conflicts of interest or biases which are typically represented at larger investment firms. 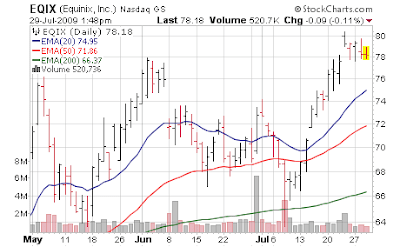 Last week, Equinix Inc. (EQIX) released second quarter earnings which were significantly above analyst estimates. The company reported a 24% increase in revenue for the quarter and locked in earnings of $0.44 compared to just $0.02 in the same quarter last year. Analysts had been expecting earnings of just 33 cents so the quarter was definitely above expectations. As an encore, management updated their full year guidance which was also above the models Wall Street had been forecasting. Equinix competes in the “co-location” and interconnection businesses and boasts a healthy stable of blue chip companies across the globe. The co-location segment essentially allows corporations to set up off-site data centers where Equinix takes on various responsibilities such as set-up, maintenance, trouble shooting, and consulting. The interconnection business enables customers to connect their networks, which allows data to move efficiently and seamlessly in order to be available at multiple locations. These services are especially important for network service providers (such as ISP’s) as well as e-commerce enterprises, and companies with video, gaming, or other media rich applications. As the overall economy continues to be challenged, corporations are seeking to do more business with fewer people. The push for efficiency has investors expecting businesses to put more capital into technology over the next few quarters. Solutions which actually enable companies to cut back on payroll costs will be given attention even if they require some capital to initiate. Equinix is known as the global leader in the co-location market as the company currently controls 42 data centers in 18 cities and 10 countries across the US, Europe and Asia. The company claims to be the only service provider with a presence in all the top 10 global financial centers. With customers such as Thomson Reuters, Chicago Mercantile Exchange, and Bank of America, this global financial presence is especially important. But far from a monopoly, Equinix competes with several other players who have carved out niche markets within the industry. 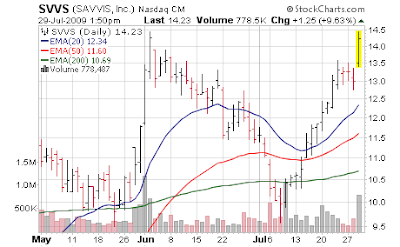 For instance, Savvis Inc. (SVVS) offers Software As A Service (SAAS) as well as cloud computing on a worldwide scope. The company will announce earnings on Wednesday before the market opens. At this point analysts are still expecting a loss of $0.19 per share for the quarter, and a loss of 63 cents for the full year. It’s difficult to value companies such as Savvis using traditional valuation methods. At this point the company is struggling under a massive debt load of $364 million compared to just $205 million in total stockholders equity. Savvis has a healthy cash balance which will allow it to continue to operate for several quarters before running out of time, but there are serious questions as to whether the company will be able to become cash flow positive before its existing capital runs out. As we have seen in recent quarters, additional capital is not always available at a time when a company needs it most. In the late 90’s many stocks traded to euphoric levels even though there were no true earnings on the books (at the time, or in the foreseeable future). Analysts began to make the argument that you could value a company based on sales alone since a high level of sales proved that the company had value. But this illogical argument eventually crumbled as clearly a money losing venture does not create value, regardless of how fast the revenue flies in the front door (and quickly out the back door). Today, analysts often look at free cash flow which is a good assessment of the business health after taking out non-cash items like depreciation or non-cash compensation. These metrics are certainly helpful although there is still a need to look at true GAAP earnings to get the full picture of a company’s income and expenses. Equinix has recently crossed over that magical line where significant fixed costs are now being completely covered by regular revenue, and the company is able to use its expanding customer base to very quickly add to the bottom line profits. When a large company which strong sales hits this milestone, profit levels can jump at staggering percentage gains for a few years as marginal new revenue is heavily weighted towards pure profit. There are two common mistakes to avoid when looking at companies who have recently turned profitable or are on the verge of making that leap. 1. For companies with impressive sales but no discernable profit, it is important to determine when profitability will come, and to what extent that profitability will add to shareholder value. Throwing out the company as an investment simply because it is losing money today will lead to missed opportunities. It may be that in 24 months, the company will be generating $2.50 per share when the stock price today is just $15. That would be a great value. At the same time, buying an unprofitable company because they have strong and growing sales could lead to significant losses. As an investor you must have a reasonable assumption as to the timing, magnitude, and sustainability of that profitability before purchasing the stock. 2. For investments in companies that have already crossed the line toward profitability, it can sometimes be easy to get carried away with the recent rate of growth. For instance, the last three quarters have seen EQIX grow year-over-year profit by 259%, 300%, and more than 999% respectively. This is typical when comparing to year earlier numbers that were just barely above zero. But while triple digit growth rates are impressive, they are most certainly unsustainable. In future quarters, earnings will have to be compared to “year ago” numbers which show actual healthy earnings. While a few very focused companies can continue to experience 50%, 80% or even 100% annual growth rates for years, this is by far the exception and not the norm. So when purchasing rapid growth stocks, one must make sure that they are paying a reasonable price. Chasing performance and buying at extreme multiples (without fully understanding the dynamics) is dangerous and can lead to devastating losses. There are a few other notable mentions in the sector including Switch and Data Facilities (SDXC) and Rackspace Holdings (RAX). SDXC operates at a small loss with significant debt, but is expected to return to profitability in 2010. That could be an optimistic assumption based on the state of the economy, but it wouldn’t take much for the company to cover its fixed costs and post a profit. The smaller corporation operates in the US with 34 data centers spread throughout the country. 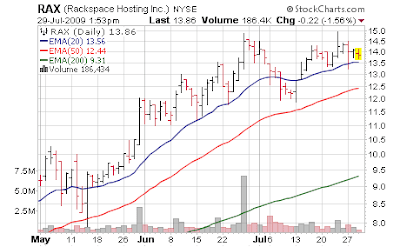 Rackspace has a more international presence with five data centers in the US, two in Europe, and one in Hong Kong. The company has a more stable track record of profitability and has posted positive income every year since 2003. In 2010, analysts expect growth of 61% which adds credibility to management’s aggressive growth program. However, the stock still trades at multiple of nearly 40 times NEXT year’s expected earnings. This is after a 258% run which has amply rewarded daring investors who picked up the stock during the spring panic. Looking at the four leaders in the sector (EQIX, SVVS, SDXC and RAX) I have a hard time recommending an investment in any of these positions. However, EQIX and RAX stand out to me as being very stable businesses that I would like to own at the right price. Over the next few months, it is likely that we will struggle with another period of uncertainty which could lead to a sharp drop in equity markets. Unemployment statistics along with a ballooning deficit and the potential for sharp tax increases will eventually come home to roost. However, a decline of this sort could push co-location stocks to an attractive level which would present us with an opportunity. So for today, the best opportunity for this sector belongs to the businesses who can count on quality services. Our opportunity as investors will likely come in the next six months. But don’t allow these names to get shuffled to the bottom of the pile. When the time is right they could be the types of investments that allow you to reap huge returns!